» Who shot the sign? What kind of a person does this point to? You pass a road sign like this — on Muller Drive in Linn County, in this case — and it gets you wondering about the person who shot it. For some people with stunted minds and a rifle, a rural road sign may pose a challenge even though it’s sitting still. “Let’s see if I can hit it from right here, maybe 200 yards away.” Unable to control their urges, they take a shot and put a hole in the sign, and then some more because they liked the first one. 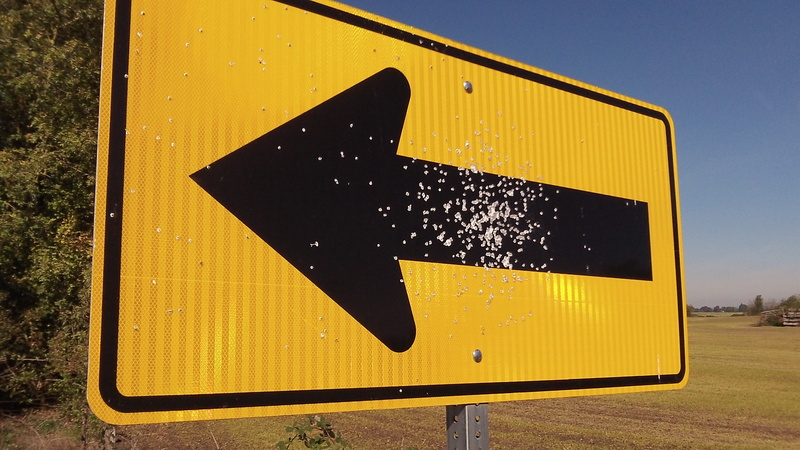 But hitting a stationary sign with a load of bird shot? What’s the motivation for that? Or was it somebody with an air gun, a can of 250 pellets and erratic aim? No, more likely it was bird shot in an act motivated by nothing other than a regrettable combination of extreme stupidity and malicious intent. The kind of person shooting at road signs in the country, one presumes, lacks self-control and has other shortcomings in his character and behavior as well. Probably steals and cheats whenever he gets the chance. Possibly tortures animals and mistreats children and anyone weaker than he. Trevor Sinnock, on Facebook: Wwwoowwwww… you really hate the person who shot that sign, huh? I’ll make sure to stay off your lawn then.